From the top of one sport to the top of another. Former USA Olympic cyclist Ken Shimizu Carpenter road his way through the belt levels of jiu-jitsu, putting in the grind for over eight years before finally being rewarded with his black belt over the weekend at the Ralph Gracie Academy in Berkeley, CA. Carpenter received his masters belt from professor Eduardo Fraga. 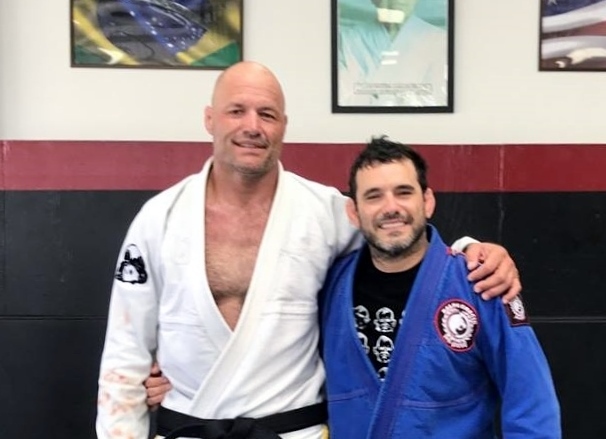 At the young age of 52, the 1988 and 1992 USA Olympian looks back at his jiu-jitsu career and fondly remembers the humble beginnings. That was the hook at 44-years-old. “Cycling takes more hours and less intensity and you’re competing by stop watch. I was physically better than most of my counterparts in the U.S. In jiu-jitsu, you can be super strong physically, but technically if you’re not there, it’s not gonna happen. I was able to rely on my physical abilities (in cycling). With jiu-jitsu, it’s a wider playing field and people have different styles and technique. You have to accept that on a given day, your’e going to lose. Carpenter comes back to visit his Shimizu family and friends every so often. His last visit was during the 2016 Marianas Open.